Imagine a world without car accidents, rush hour or congested parking lots. To some this sounds like a far-off nirvana, but to Dr. Xiaopeng “Shaw” Li, it is an imminent future we need to plan for now. The Susan A. Bracken Faculty Fellowship has been critical in furthering Dr. Li’s research at USF and abroad. 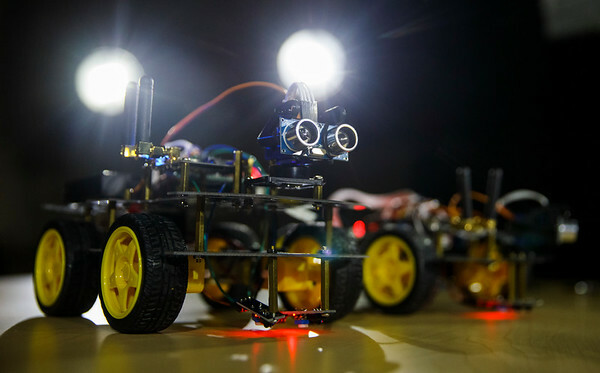 Over the past year, Dr. Li used his fellowship funding to begin developing a reduced-scale autonomous traffic testbed in his lab complete with programmable robot cars to use for experiments. It has also enabled him to travel to present his findings and collaborate with other top institutions around the world to expand his research impact and advance his theories. Dr. Li programs the robot cars to use on a testbed in his lab. For USF College of Engineering alumnus William Bracken ’89, ’94, the driving force behind the gift to create the endowed faculty fellowship was two-fold – to repay the school that gave him his start, and to thank his wife who has been there from the start. Through their business, Bracken Engineering, Susan and William Bracken have supported the college in many ways, including the creation of a lecture series, scholarship and the hiring of numerous USF interns and recent graduates.